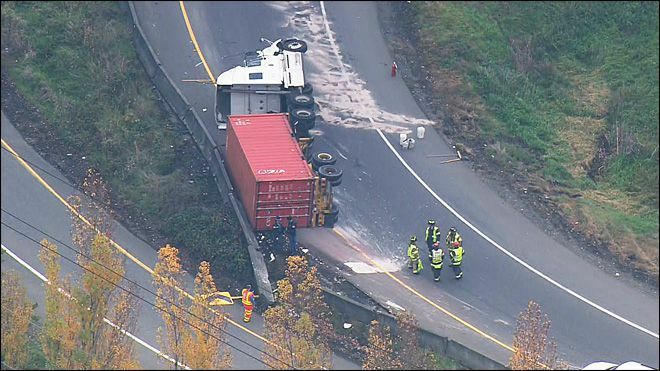 What Causes Semi-Trucks To Roll Over? Why do Semi Trucks Roll Over? You’re stopped in traffic during your commute when you hear the news on the radio: a semi-truck has rolled over on the road ahead of you, closing multiple lanes on a busy road and reducing rush-hour traffic to a crawl. It’s a familiar scene, and it’s only growing more common as Washington state’s infrastructure ages and local cities’ populations continue to boom. But why do semi-trucks roll over so frequently? Shouldn’t these big trucks, hauling valuable material, be extra secure? The truth is that that semi-trucks are especially prone to rollovers, putting truckers—and the drivers who have to share the roads with them—in danger. Rollovers happen when a truck has to change direction too quickly, resulting in the heavy trailer and the attached cab tipping over onto their sides. A truck moving at highway speeds has a massive amount of momentum; they have to turn, slow down, and speed up more gradually that passenger cars because they’re built for size, not maneuverability. When a semi-truck travels around a curve, centrifugal forces cause the heavy truck to lean away from the direction of that curve. Too much centrifugal force—caused by an improperly balanced load, excessive speed, or a curve that’s too tight for a truck to safely travel at normal speeds — can cause the truck to tip over. Most passenger cars don’t roll easily because they have a high rollover threshold: because their centers of gravity are much lower than trucks, they tend to slide out of a tight turn instead of tipping over. In tanker trucks, the heavy fluid inside the tank may even slosh around enough at high speeds, exerting enough pressure on one side of the tank that the whole truck rolls over. A study of large truck rollover crashes found that nearly half of rollovers are caused by a failure to adjust the speed of the truck to the conditions of the situation. Truckers have rolled over because they were driving too fast around a curve, not taking the conditions of their brakes into account while trying to stop, not taking into account the physics of the loads they were carrying, or not adjusting their driving to the conditions of a particular road or intersection. Another major cause of crashes was driver inattention: drivers who zoned out, got distracted, or even dozed off in their seats caused rollovers. Steering problems were found to be another major factor in crashes, with over-steering around curves or over-correcting after drifting out of a lane causing these big trucks to become unstable. And general driver inexperience, or failures to account for the height and weight of their massive trucks, caused accidents on the road. Rollovers kill hundreds of truckers every year, with approximately 3,000 injuries to truckers and 300 truck occupant deaths happening every year in America. This is one of the most dangerous types of semi truck crashes. Crashes are the leading cause of on-the-job death for truckers. Drivers who have to share the road with semi-trucks also suffer. It’s not just about traffic slowdowns: truck accident fatalities have been surging on our nation’s roads, with approximately 4,000 deaths and more than 100,000 injuries in truck crashes reported by the Federal Motor Carrier Safety Administration every year. If you or a loved one has been injured or killed in a semi-truck rollover accident, it may be time to contact an experienced trucking accident attorney in your area. 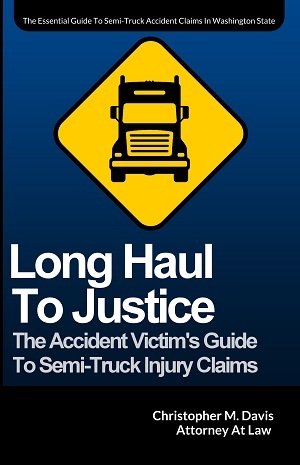 With little public outcry over the massive numbers of casualties caused by truck accidents, and few pieces of legislation devoted to improving trucking safety, it’s up to attorneys to put pressure on negligent drivers and negligent trucking companies that prioritize profits over safety. For your own personal safety, always pass a truck at a safe speed but do not pass and pull into his lane and slow down. Or stay behind the truck at a safe distance. Do not stay beside a truck at the same speed if you can avoid it. Do not stay beside a truck in an outside lane on a curved on ramp. Remember the truck's center of gravity is much higher than the car or SUV you may driving and some drivers become careless or complacent and discount the slower safe speed they must abide by to remain safe. It is your life, you must learn how to drive to protect it. Your speed and distance relative to all conditions is always your responsibility for a safe trip or journey.